Welcome to 2016 everyone! In the western world it is the beginning of a new year - which inspires thoughts of all beginnings, especially the beginning of an animated action. So whatever movement you attempt you will need to learn how to make that animation more dynamic. You can do this by building in a degree of 'anticipation' to its movements - especially at the beginning of a major movement. In my forthcoming Focal Press book, 'The Animator's Sketchbook', I refer to this when talking about a character throwing a heavy sack. Before they can manage to actually throw the sack they initially have to swing it in the opposite direction to develop more momentum for the throw. This initial swing back is called 'anticipation'. That is, before you make a move in any particular direction it is best to anticipate that move in the opposite direction first. 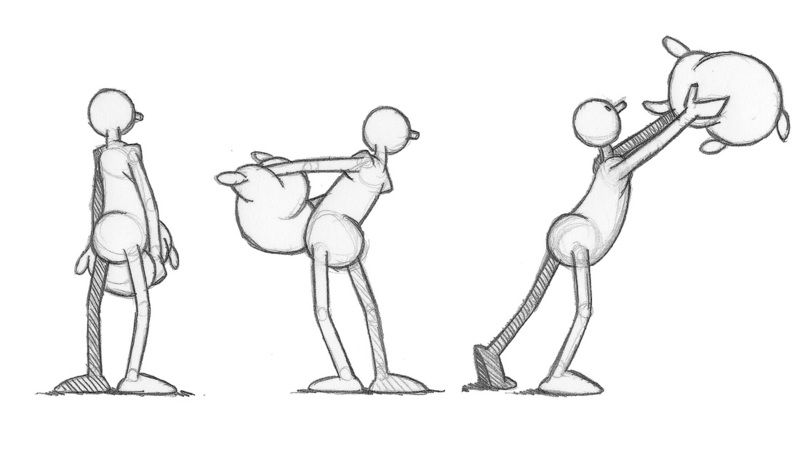 This is something you should consider adding to any significant animation movement you make, not just the first move. Please put all your drawings onto one page!